Can the musical experiences of El Sistema reduce bullying? Do students show more respect and less tendency toward bullying when they start learning, practicing and performing music together? As a music teacher with lots of hands on experience, I believe the answer to the above question is a resounding ‘YES’. I have personally seen many children benefit from being part of a musical group of some kind. Let me tell you about ‘el Sistema’. El Sistema was started in 1975 in Venezuela by José Antonio Abreu. At the very start, Jose met with eleven children in a garage to share his love of music with these children. El Sistema has now grown to be a huge organization with a worthy mission and over 350,000 participants in Venezuela alone. These children all receive free choral and/or orchestral training. The mission of el Sistema is: “to help children and young people in achieving their full potential and acquiring values that favor their growth and have a positive impact on their lives in society” (http://fesnojiv.gob.ve/en/mision-y-vision.html). El Sistema has now spread to other countries including Canada and the United States. I believe children benefit from belonging to a group of some kind where they achieve a positive outcome. El Sistema is one example of such an experience. Children can become surprisingly passionate and devoted to groups of this kind, and they seem to become more respectful, happier and subsequently develop into well rounded individuals. In my opinion, el Sistema is a powerful, positive experience that can increase respect and reduce frequency of bullying occurrences. 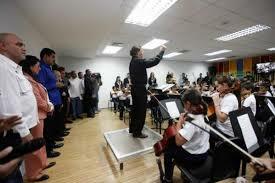 This entry was posted in Bullying in elementary school, dealing with bullying and tagged el sistema, music programs, musical groups on June 9, 2014 by Bruce.